Some consider Lynn Valley to the the Mountain Biking Capital of the World. It started with a few North Van guys asking “What if.…”. Now, only thirty or so years later, mountain biking is an Olympic sport and “The Shore” is known internationally as the mecca for avid, year-round biking enthusiasts. While bikes with bigger than typical tires were first developed in California’s Marin County for use on that area’s rolling trails, riders in North Vancouver discovered the bikes were not equal to our rugged terrain. As local trail riding became more adventurous – with single-log bridges over streams becoming ever narrower and higher off the ground – new, sturdier bikes had to be developed. Over the 1980s and 90s, steep, up-and-down forest trails became dotted with stunts such as ramps, cliff drops, teeter-totters and “skinnies” – fallen trees planed on the top surface and suspended 10 or 15 feet off the ground. Many of the trails were built by Lynn Valley’s Todd “Digger” Fiander, but in recent years trail-building has also become an activity undertaken by various members of the North Shore Mountain Biking Association, who work with the District of North Vancouver to ensure appropriate environmental and safety standards are maintained. That said, mountain biking by definition comes with a series of risks that the wise rider takes into account. A full-face helmet and gloves are the minimum requirement, and most riders know to don specialized bikers’ body armour that protects the chest and extremities. Local riders caution that a trail marked ‘intermediate’ here would likely be rated a ‘black diamond’ ride in the rest of the world. You can get a sense of the trails by checking out the local online mountain biking forums, or asking one of the riders you’ll encounter en route to the trail access points. 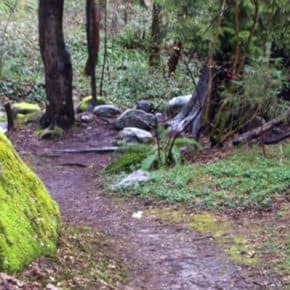 Many trails – marked and unmarked – criss-cross Fromme Mountain and are accessible from the topmost reaches of Lynn Valley. Most drop off the Old Grouse Mountain Highway (the gravel road that leads off the top of Mountain Highway). Trails can also be accessed from a small parking area off the Dempsey-Braemar Road. The old mountain highway has several sharp switchbacks. Easier “single-track” trails – non-technical routes with smooth, flowing trailbeds – can be found between the first and second switchbacks. “Bobsled,” a trail custom-built by the District of North Vancouver for beginners, is a good first choice, or look for other runs such as Roadside Attraction, King of the Shore, and Griffen. Longer, steeper, more challenging routes are situated above the second switchback and are suitable only for experienced mountain bikers. 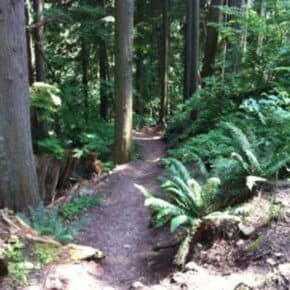 For a map of the trails on Fromme Mountain, check out this map produced by the North Shore Mountain Biking Association. 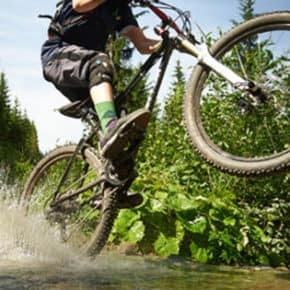 Individuals and groups such as the North Shore Mountain Biking Association have worked hard to ensure that their trail-building and biking activities complement rather than detract from the natural beauty of the rainforest, which is also enjoyed by hikers, dog-walkers and naturalists. Please do your part by observing parking regulations in Upper Lynn Valley, remaining on the trail at all times, refraining from altering or adding to the trail, and packing out anything you’ve brought in. If you’re interested in joining up with like-minded riders who help maintain the trails, consider taking part in a Trail Day organized by the NSMBA. Information boards and a drop-off point for bikes are located a few hundred yards up Grouse Mountain Highway, near the water tanks. You don’t have to be a daredevil to find bicycling options in Lynn Valley. If you’re interested in a more traditional ride, a popular choice is the 11-kilometre paved forest road that leads through the Lower Seymour Conservation Reserve, all the way to the Seymour dam and fish hatchery. For a map of the multi-use LSCR, and to see the many opportunities it offers to cyclists, mountain bikers, dog-walkers, hikers and equestrians, click here. The LSCR is accessible via a short walk or ride from the top of Lynn Valley Road. Car drivers must access the park from Lillooet Road, which climbs past Capilano University on the other side of Lynn Creek.